Select another cartoon to view it in more detail. What is Billy Hughes doing? How would you describe his attitude? What kind of event is he dressed for? The second figure is a young boy. 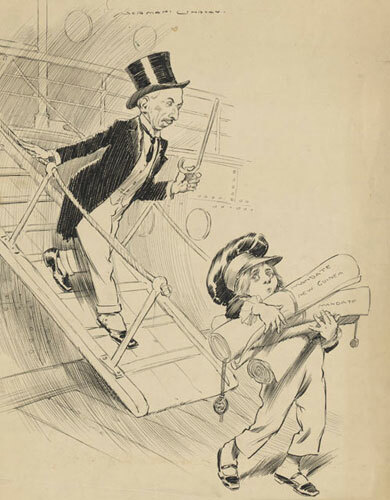 After Federation cartoonists often drew Australia as a child. Why? How would Australia be represented today? 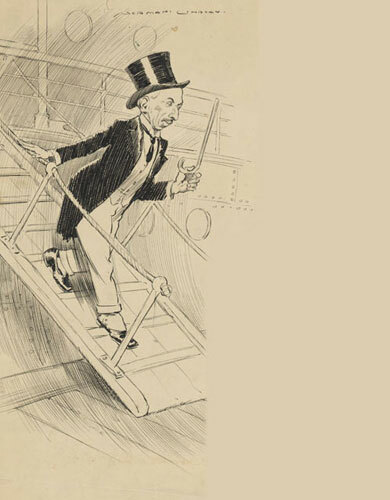 Can you find other examples of Australia being represented in historical cartoons? What emotions can you see on the boy’s face? Look at the documents the boy is carrying. How would you describe them? What is a mandate? The cloud by Norman Lindsay was drawn in 1919 when Billy Hughes returned from the peace negotiations in Europe. Billy Hughes represented Australia at the peace talks. This was the first time that Australia had a direct voice in an international forum. Previously Britain spoke on behalf of Australia’s interests. At the conference Billy Hughes negotiated for control of territories close to Australia that were seized during the War. He gained a mandate for Australia to govern New Guinea. 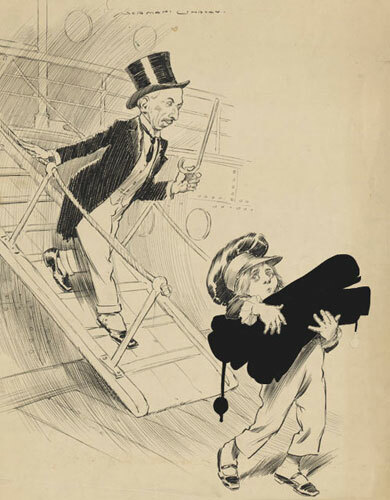 The caption for the cartoon was; Uncle Billy – ‘Aren’t you fond of me for bringing home all these nice things to play with?’ Aussie – ‘Yes. I hope I’ll like them but they feel pretty heavy.’ What do you think the cartoonist was trying to say?